The data was added on ,	13 August 2016 read 544 times. Iraqi security forces have liberated four villages south of the strategic northern city of Mosul from the Takfiri Daesh terrorist group, continuing a push to flush the extremists out of the city. The Iraqi Joint Operations Command announced in a statement that security personnel had taken control of the villages of al-Bazajleh, al-Marir, Imam Gharbi and al-Tale’ah, which lie on the suburbs of the town of Qayyarah and more than 60 kilometers (40 miles) south of Mosul, on Friday, al-Baghdadia television reported. The statement added that scores of terrorists were killed and seven vehicles rigged with explosives destroyed during the operations. Hisham al-Hashimi, a consultant to the Baghdad government on the anti-Daesh campaign, has said the operation for the liberation of Mosul is slated for late September. According to Iraqi officials, high-ranking Daesh commanders and their families have sold their belongings and fled Mosul as Iraqi forces are closing in on the northern Iraqi city. Mosul fell into the hands of the Takfiri terrorists in June 2014 when they launched an offensive in Iraq. 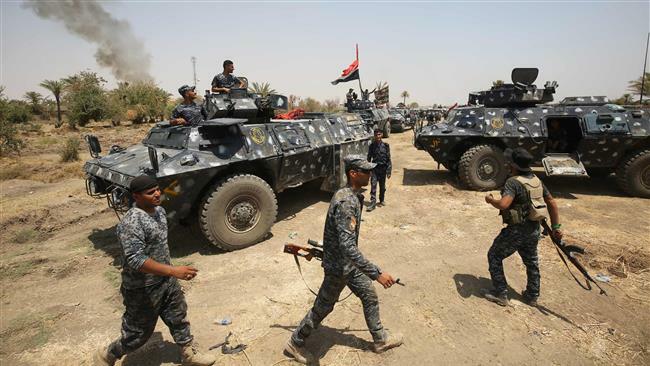 Separately, Iraqi military aircraft, aided by intelligence from elite counter-terrorism forces, launched four precision strikes against the positions of militants in the northern province of Salahuddin, destroying a large volume of munitions. The strikes also killed a Daesh bomb making expert, identified as Fahem Mejbel Ezzedine al-Ani but better known by the nom de guerre Abu Razwan al-Ani. Iraqi F-16 fighter jets also struck terrorist positions in the northern oil-rich province of Kirkuk, killing Daesh’s self-proclaimed Kirkuk governor Abu Mishan al-Janabi, his second deputy, Mohammad Rashid al-Janabi and seven of their fellow terrorists. The northern and western parts of Iraq have been plagued by gruesome violence ever since Daesh terrorists mounted their offensive in June 2014. The militants have been committing vicious crimes against all ethnic and religious communities in Iraq, including Shias, Sunnis, Kurds and Christians.